Expected to be unveiled at the "It's show time" Apple event on March 25, the video service is largely believed to involve Apple offering free original content to customers, while at the same time highlighting third-party services users can pay to watch. According to Macquarie's analysts, in an investor note seen by AppleInsider, the service will make a "big entry in the over-the-top video landscape," though there are some unknowns the firm tries to answer. Analyst Tim Nollen suggests that analysts should question how widely the service will be available, in that while Apple's primary aim is to "improve the user experience," it should be asked if this would need for it to be platform-agnostic or platform-exclusive in Apple's approach. "Precedent set by Apple Music would support the former alongside any demands from talent for wider distribution, and making the service available on Android, desktop, and Smart TVs may help drive subs in the near term," Nollen suggests. Even so, the analysts "wouldn't be surprised" if it was limited to just iOS and Apple TV as a strategy to combat hardware churn. Highlighting suggestion from others that Apple will offer "bundles" of channels at a cheaper price than buying them separately, analyst Ben Schachter believes Apple could offer a bundle of multiple services, including Apple Music and Apple News, as well as cloud storage. Raising previous discussions from Apple about "changing the way consumers access video," it is proposed this could mean new hardware or an innovative form of a guide-type service for consumers. 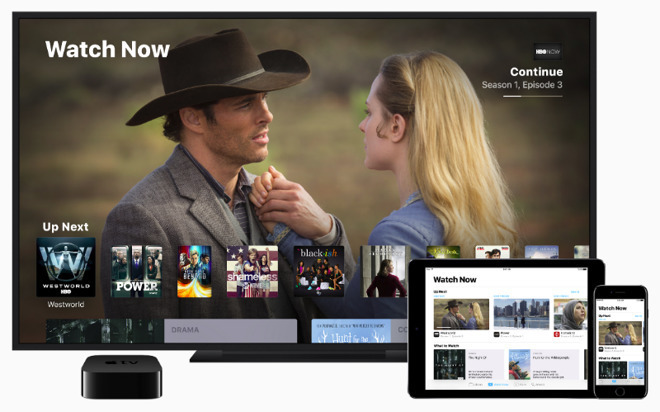 While Apple will become a new avenue for content distribution for content producers, analyst Amy Yong proposes the bundled channel offers could threaten traditional cable and satellite providers, as well as other streaming television services. "We believe HBO and Starz content may be incorporated into the offering in an ad-supported/add-on capacity," suggests Yong. "With a tiered HBO-branded over-the-top offering coming, HBO content will likely be limited. For Lionsgate and Starz, Apple can provide an avenue for rapid international growth and also look to purchase original studio content." The revenue potential for Apple could be quite substantial, as analysts previously suggested that, if it reached 100 million subscribers by between 2022 and 2024, Apple could be earning $10 billion in revenue from the service. Macquarie maintains a "Neutral" rating on Apple stock, with a price target of $149. At the time of publication, Apple's stock price is at $194.